Apparently, there are some people in the world who don’t like their job. These people are either going to really love Horrible Bosses, or cringe because it just hits too close to home. In the film, three friends played by Jason Bateman, Jason Sudeikis, and Charlie Day, plot to kill their bosses because, well, those bosses are horrible people. They’re overbearing, they’re abusive, they stifle growth, they demean, they’re disrespectful, they sexually harass, they insult … and that’s for starters. To avoid getting caught, Nick, Kurt, and Dale (Bateman, Sudeikis, and Day’s characters, respectfully) take a cue from Hitchcock’s Strangers on a Train and plot to murder each other’s boss. But nothing goes as planned, of course. The film is great fun, and well made. Each of the actors — the aforementioned leads as well as their bosses, played by Kevin Spacey (worse here than in Swimming with Sharks), Colin Farrell (in an absurd but hysterical comb-over), and Jennifer Aniston (eat your heart out, Angelina Jolie), plus Jamie Foxx, as the guys’ “murder consultant” — turns in a solid performance, and the script by John Francis Daley, Jonathan Goldstein, and Michael Markowitz has a bunch of quotable lines (including a Good Will Hunting reference that I am not going to include here). I even love how in one scene, a Muzak version of the Gnarls Barkley song “Crazy” plays in the background. Nice touch. After a smart, well plotted first half, the film does start to sag a little about two-thirds of the way in, but it pulls itself together in the end to leave you smiling. That is, if your mind isn’t racing with ideas. 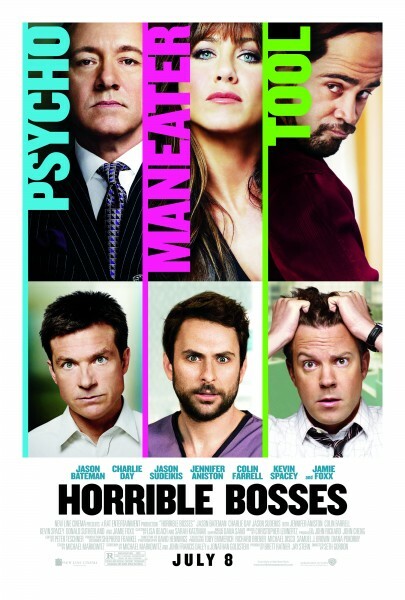 I’m giving Horrible Bosses a B+.